Every since it was discovered that Disney would be adding additional characters to the “it’s a small world” attractions, Disney fans have been curious as to which characters would actually be finding their way into the attraction. 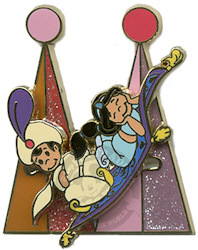 The controversial plan caused an uproar last March among Disney purists, who called the changes a “gross desecration” of ride creator Mary Blair’s stylized artwork.Now through the release of a new a limited-edition pin collection which features 14 of the approximately two-dozen Disney characters “as they will appear” when the Small World attraction reopens, Disney has inadvertently let the cat out of the bag. 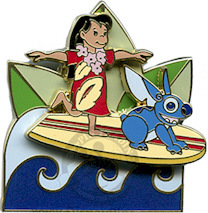 The collectors pins, created by artist Monty Maldovan of the Disney merchandising group, represent a simplified version of the characters and settings as they will appear in the Small World attraction. After it was discovered last year that well recognized Disney characters would be incorporated into the attraction, many purists were outraged. In a pair of pleading open letters to Disney brass, Small World creator Mary Blair’s family as well as a dozen Disney and Pixar creative artists begged the Anaheim theme park to preserve Small World. Soon after, an online campaign urged Small World fans to call, write or e-mail Disneyland, Walt Disney Imagineering or Disney’s corporate headquarters to put a halt to the proposed changes. While the pins certainly provide a “peek” into what is to come, we will have to wait until “its a small world” reopens on or around February 5th to see actual characters in place.